If you’re an owner of an 16GB iPhone 4S or a 8GB iPhone 4 and currently locked on a particular carrier, chances are you’re searching for a solution to make the device SIM-Free Forever. While some services will try to sell you all sorts of stuff and claim that your iPhone will be unlocked afterwards, probably most of them are not going to work and you may not even get your money back. There’s no one in the world who wants a locked phone anyway, unless you’re from another planet. 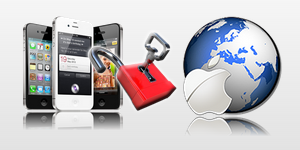 The only genuine solution that’s currently available is the factory unlock IMEI solution. After this unlock, you’re able to insert the SIM card of any carrier. For those who don’t know, the phones that come directly out of the production factory are referred to as factory unlocked in the first place. They’re accompanied by an IMEI number that’s quite unique and the lock status of the device is dependent on this number. For those of you whose iPhone 4 8 GB or iPhone 4S 16 GB is locked, it’s not the best situation as you can’t use any other SIM card. While you can directly ask some carriers to unlock your phone, the policies are quite strict and you’ve to sign several papers before they do so. Furthermore, some networks like Bell Canada or Softbank Japan are so expensive to unlock that you’ll go over your budget. The reasons why iPhones are so though to unlock now is because Apple has patched a lot of servers in recent times which have made it difficult for the services. Luckily, our recommended service has access to database of all carrier networks so they can mark your device’s status to unlock. There are different prices for different networks, and you can check our list to find out the price of your network. iPhone 4 8GB GSM White (Serial number ends with DP0N, DZZ, A4S or other). iPhone 4S 16GB White (Works with Serial that ends with DTC0, DT9V, DT9Y and others. iPhone 4S 16GB Black (Tested with Serial No. that ends with DTD0, DTD1, DTD2 & more. The network your phone is locked to doesn’t matter. Whether it’s Swisscom, Verizon USA, Orange, O2, Bell Canada, T-Mobile, Telenor under contract in Sweden, Vodafone, or SoftBank Japan, if it matches the requirements, it’ll be unlocked. Step 1: Go to the official website of the company. Step 3: Be patient until you receive e-mail of confirmation. Step 4: Take a USB cable and connect the phone to the PC. Step 5: Open iTunes software and your iPhone 4 8 GB or iPhone 4S 16 GB will be SIM-Free. After the device is locked officially, feel free to use it on any network anywhere and update to latest software updates. Click here for iPhone 4 8GB Unlock and here for iPhone 4S 16GB Unlock.